With US equities weak for the fifth consecutive day, the VIX was naturally continuing to climb, settling +4.2% @ 22.39 (intra high 23.31). 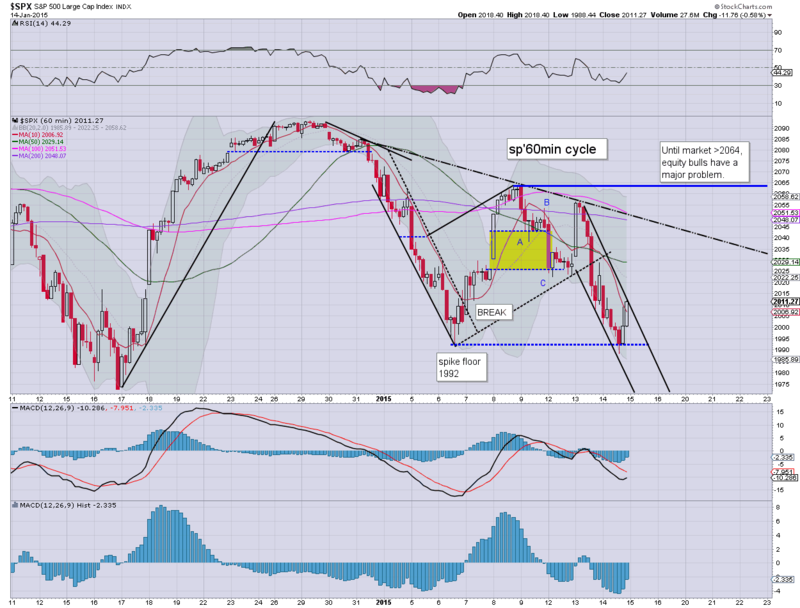 Near term outlook offers a test of the important 200dma of sp'1965... which might equate to VIX 25/27 zone. *naturally, with equities sliding for the fifth consecutive day, the VIX inversely mirrored... rising for the fifth day. Suffice to add.. the only solace for the equity bulls is that the VIX did not break a new cycle high today, but that seems likely tomorrow (opex).. or next Tuesday (Monday is closed). Based on the MACD (blue bar histogram) cycle, equity bears have at most another 3 or 4 days in their favour. US equities saw a fifth consecutive day of weakness, sp -18pts @ 1992. The two leaders - Trans/R2K, settled lower by -0.4% and -1.9% respectively. 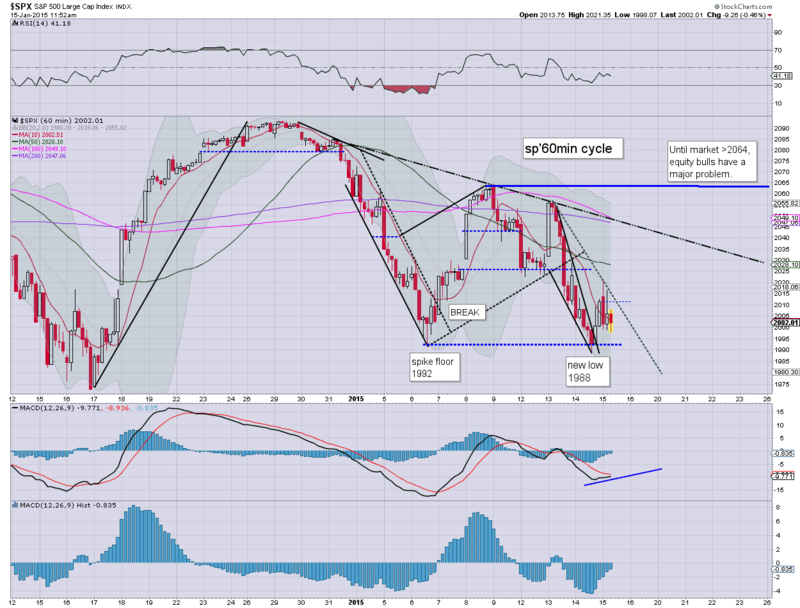 Near term outlook is for continued weakness, most likely to at least briefly test the 200dma of sp'1965. Suffice to say... an 'entertaining' day. 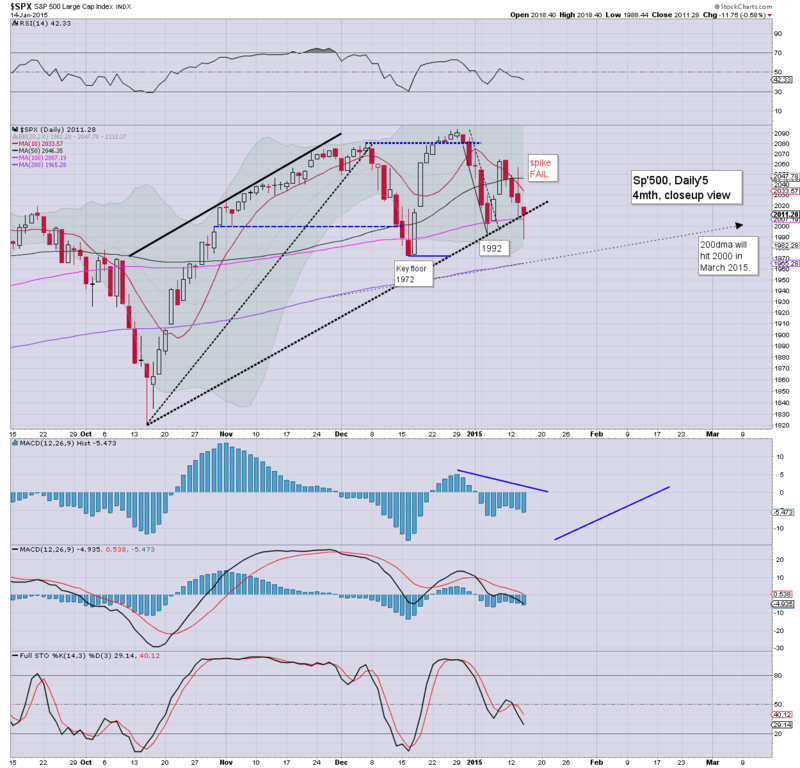 It would seem highly probable that the market will at least briefly test the 200dma of sp'1965... whether tomorrow, or next Tuesday (market is closed Monday). the usual bits and pieces across the evening.. to wrap up the day. Regardless of the close (even a moderately higher one.. if very unlikely).. it has been a fifth day for the bears, helped by some serious capital market turmoil via the SNB. Gold is holding a strong 'fear bid', +$30. Oil has seen a severe swing... losing gains of 5%... now -3.5%. ... indeed, regardless of the close... today has been another failure for the bull maniacs. The renewed weakness in Oil has surprised many.. and whether you want to call the bounce to $51.73 a sub'4, wave'D.. or whatever... there is no clear floor yet. 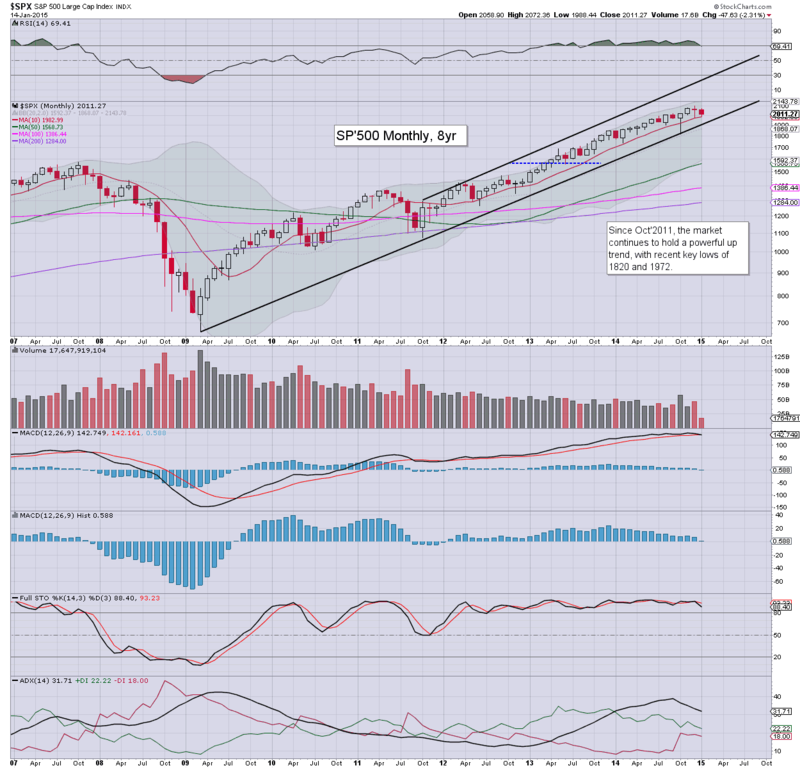 3.15pm.. Market getting twitchy... sp'1997... a close in the 1980s... breaking the Wed' low of 1988...just about possible. In any case... weakness into Friday opex... and the long 3 day weekend. We look set for weakness tomorrow. and early next Tue/Wed... to sp'1965. *I realise some are now looking for sub'1900.. but that seems very difficult, not least with the ECB set to spool up the printers... with QE-pomo for the EU capital markets. The Wed' low of sp'1988 looks set to be broken.. whether late today.. or tomorrow. 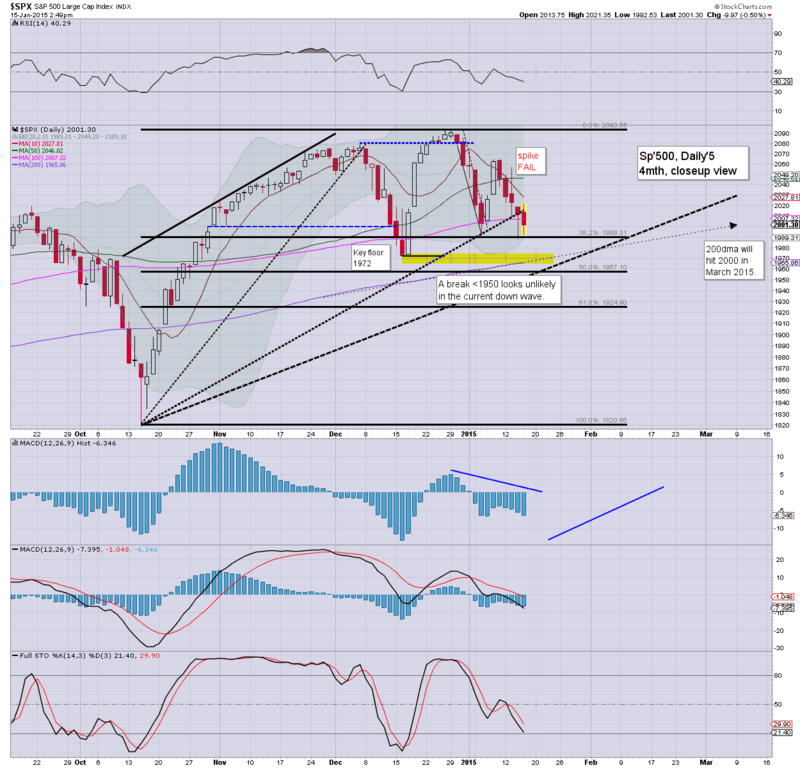 Next Fib' retrace level is 1957... although that looks a stretch, given that we're already day'5 down. What is clear... in the next multi-week up wave.. if the bulls can't manage a new high.... it will confirm the provisional warning now seen on the giant monthly cycle. *as things currently are... sp' monthly cycle has a bearish cross (again)... giving MARCON 6.. but how we close the month is what really matters. So... we're lower for the fifth consecutive day... and market is getting increasingly rattled by the periodic 'financial events'. Certainly, this morning's SNB policy change has upset many... and some will no doubt be on the receiving end of a margin call from hell today. In many ways.. it is relief that we have a 3 day weekend ahead! 2.03pm.. the entertainment continues............ Oil -3.5%... having been +5% Crazy day. US equities are increasingly weak, breaking a new intra low of sp'1992. 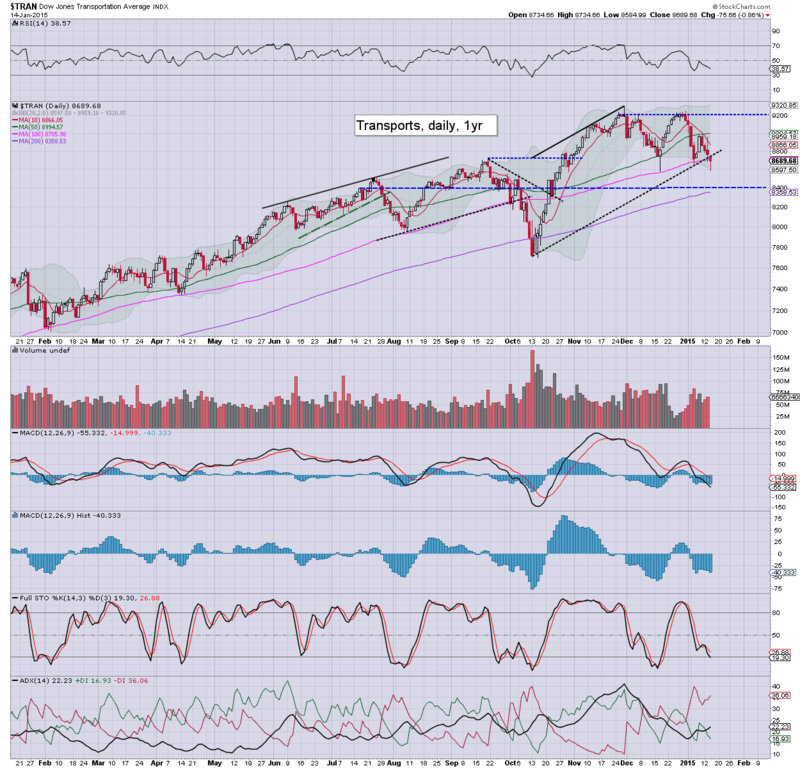 Next target is 1988... after that... no real support until the 200dma of 1965. VIX is naturally on the rise.. +8% in the 23s. 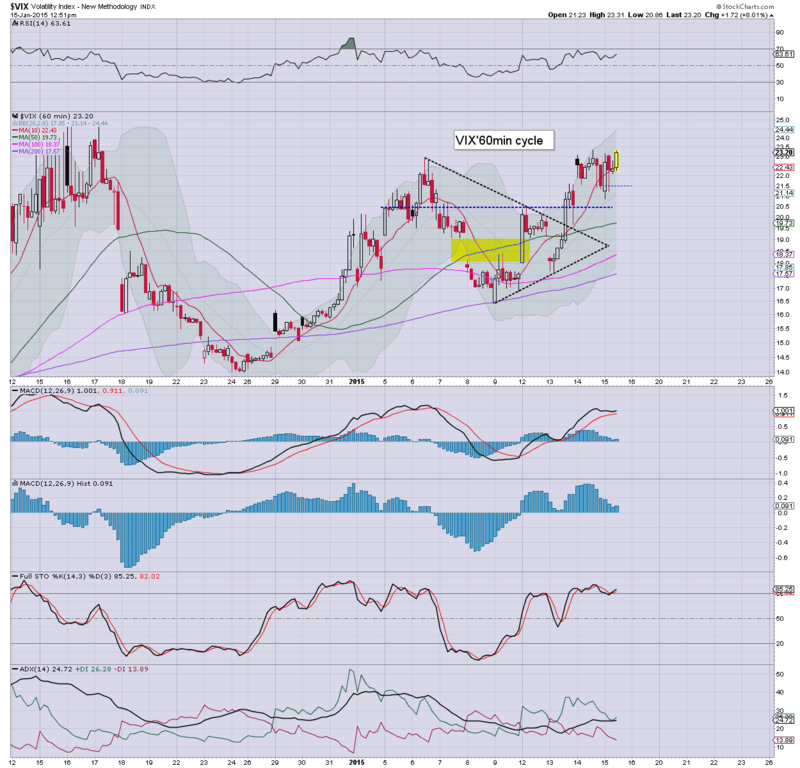 Gold is holding strong gains, +$34. Oil is -1.8%..having lost spike gains of 5%. It sure is not looking so great. Despite sporadic jumps higher... the market appears like it wants to make a hit of the 200dma... which is some 1.5% lower. As for Lagarde... she sure didn't seem confident.. and the market never wants to see its banker overlords appearing weak. Euro/$ parity.... remains viable in the very near term. 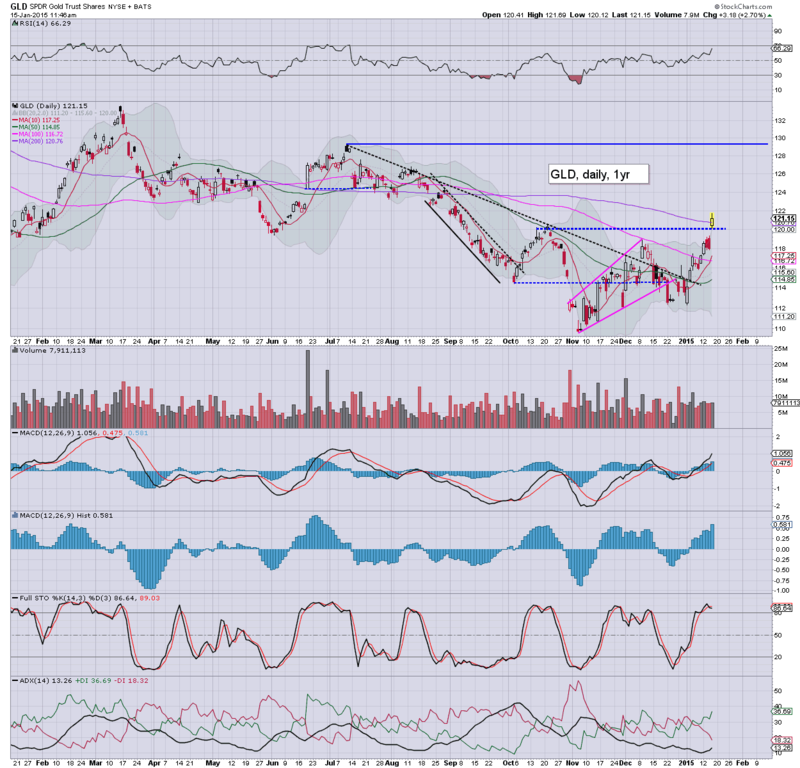 Strength: miner ETF of GDX +6.1%... not surprising... with the Gold gains. Whilst the capital markets continue to struggle to adjust to the massive policy change from the SNB.. its time for a little polite chit chat. Mr Market will no doubt take some interest in clown finance TV 'economics expert' Liesman... with IMF 'Managing Director' Lagarde. *Gold continues to rise on a strong 'fear bid', with a clear break above the mid Oct' high. 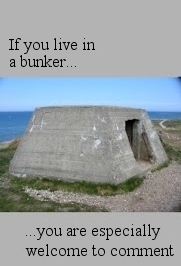 I still can't take it seriously though. Still seeking renewed wave lower to $1000 by mid summer. So... settle back.. for some chat.... if you can stomach it. It remains a real mess, with dynamic swings in just about everything. On a pure technical basis, the hourly equity cycle is set to turn positive within the hour... offering upside into the close. Yet.. all things considered.. the threat of another washout remains high. Frankly, I can only imagine the number of margin calls out there today. It will likely take some time for things to settle down. Now the issue is 'the ECB sure as hell better not disappoint' next Thursday. If they do fail to 'inspire'... market is going to the end month badly... something that (importantly).. did not occur in October. 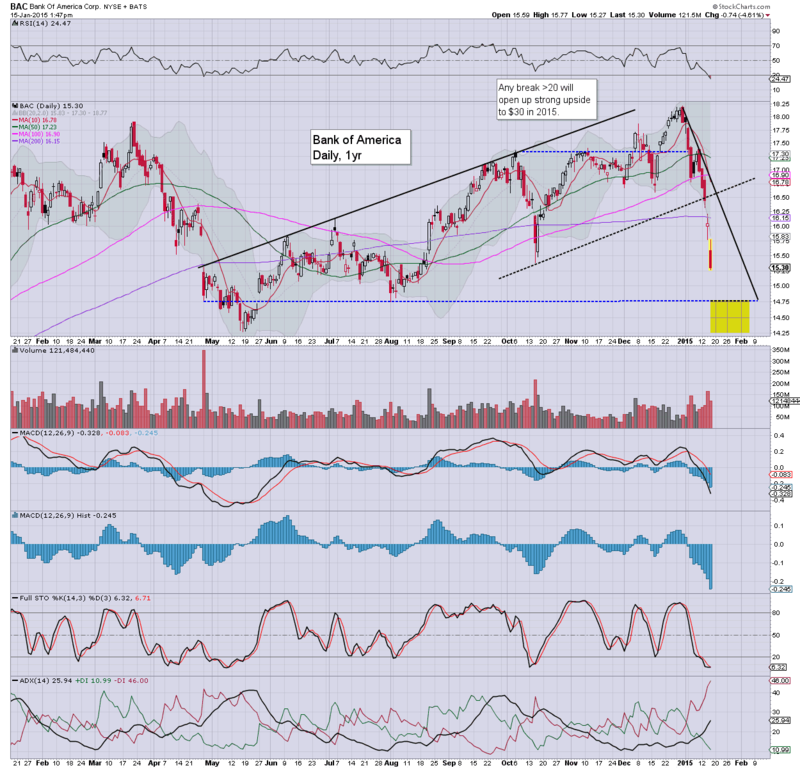 Notable weakness, BAC, -3.0% on earnings. 11.36am Looks like someone hit a sell program on the momo stocks... TWTR -4.3%.. along with most of the others. A long day ahead.... strap IN ! 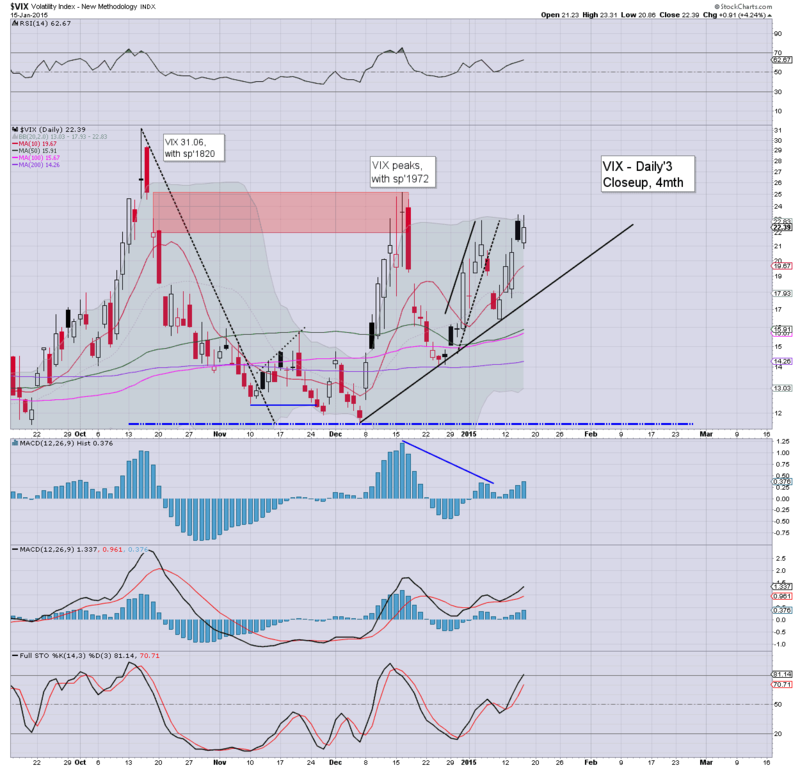 VIX is threatening to explode into the mid/upper 20s.... along with a drop to sp'1965. 10.16am.. sp -4pts @ 2006... still.... its wild swings out there today.... whipsaw hell. Gold +$33... helping the miners.. GDX +4.9%... but I do NOT see a multi-year floor in yet. Good morning. World capital markets are in something of a state of turmoil.. with the Swiss having dropped their peg to the Euro. Overnight futures swung from +15pts to -25pts, but now back to sp -4pts, we're set to open at 2007.. but things are VERY unstable now. Frankly... 'OMG'.... things really have got wild overnight. First... see HERE for a BBC story on the Swiss currency change. The price action has been absolutely wild. Swiss bank have decided to abandon the Euro peg... that has stood since Sept'2011. World equities all sharply collapsed on the news.... but most have rebounded. Yet... there are far bigger implications to all this... and so many questions. Why did the Swiss do this? Why now... why not yesterday? What do they believe is coming? Are the Swiss re-positioning ahead of the ECB next Thursday, when QE t-bond buying is set to be announced? Without question, we have one wild day ahead... very hard to have much idea how we'll close today. A drop to sp'1965 remains viable.... but as things are now... clearly... there are 'system' changes underway. *don't forget....econ-data due.. along with a Lagarde interview this lunchtime. 8.19am.. 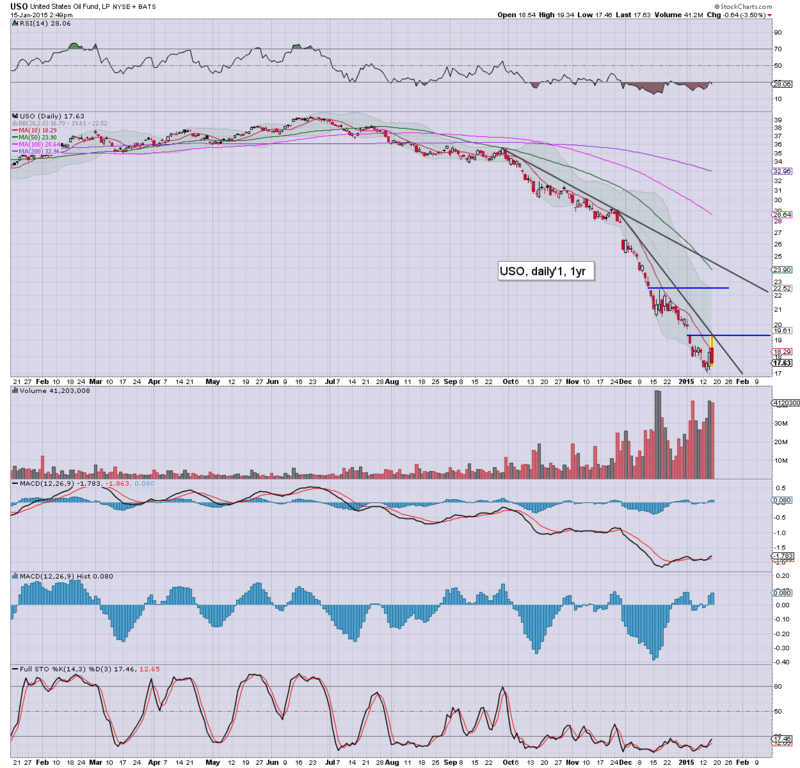 Notable weakness, BBRY -15% @ $10.60s... having denied the bid talk. sp +1pt at 2012... ahead of the econ-data.... price action remains VERY unstable. 8.32am... PPI comes in -0.3%.... weak. 8.46am.. despite lousy jobs data... futures swinging... sp +12pts... 2023. It was a fourth day for the equity bears, but the ECB are set to ruin the party next week, with a very likely announcement of a t-bond buying programme. 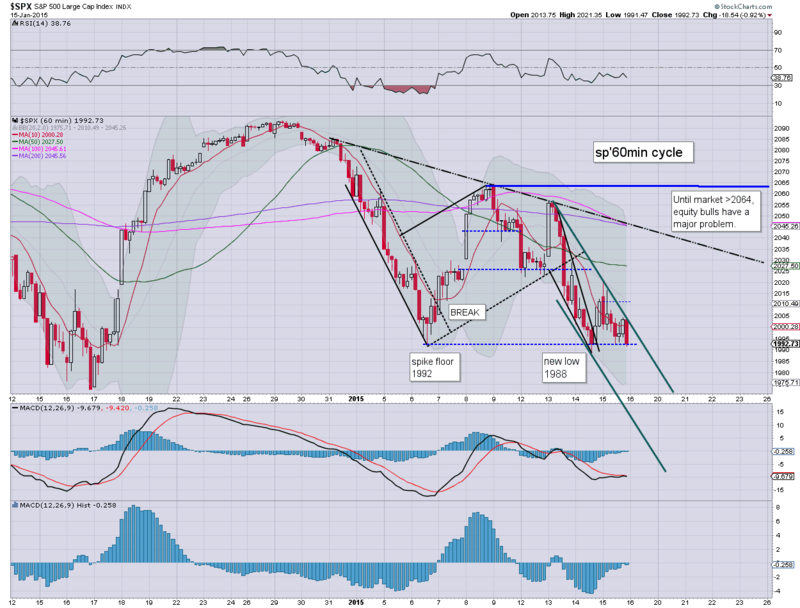 Regardless of the QE amount, the market will likely be 'inspired' higher into month end. 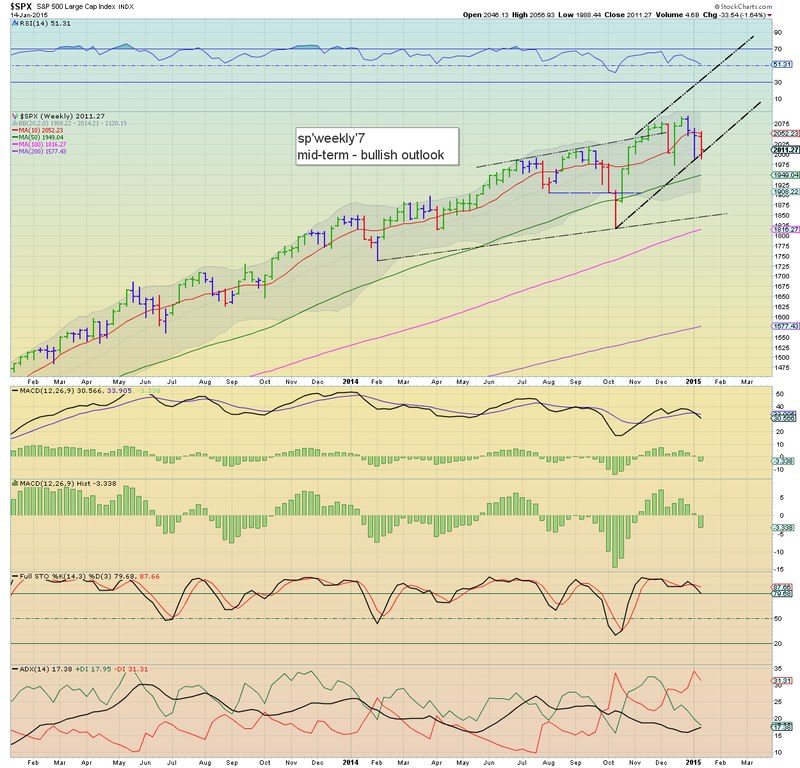 *With the earlier break under sp'2000, the monthly cycle has been offering an initial warning sign, via a MACD bearish cross. As things are.. if the market can ramp hard into month end (seemingly likely).. then bears will be still be awaiting a confirmed closing monthly turn. So far this month, we're net lower by -2.3%... in the scheme of things, its not a massive amount, and it won't take more than a few days of upside to turn the month positive. Considering the ECB are set to launch a T-bond buying program, the market looks set to rally into end Jan/early Feb. Those currently short should have good short-stops of at least some degree. A new multi-year low of $2.42... close to target zone. 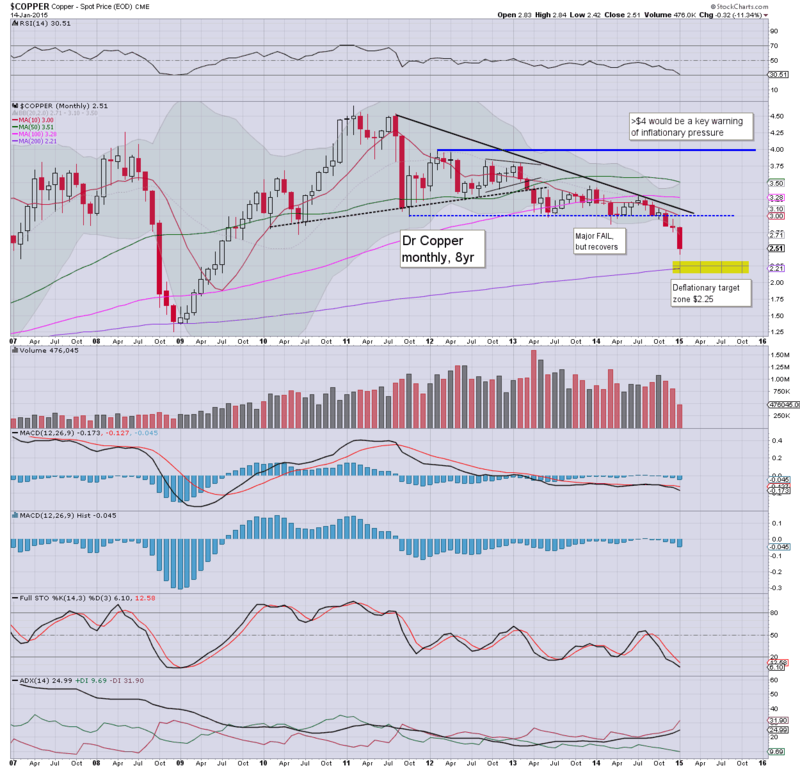 I would get 'deflationary spooked' on a monthly close <$2. That seems unlikely though. Thursday has a quartet of data.. weekly jobless claims, PPI, empire state, and phil' fed manu' survey. *clown finance TV 'economic expert' Liesman is set to interview IMF 'Managing Director' Christine Lagarde at 12pm, and Mr Market will no doubt be watching. 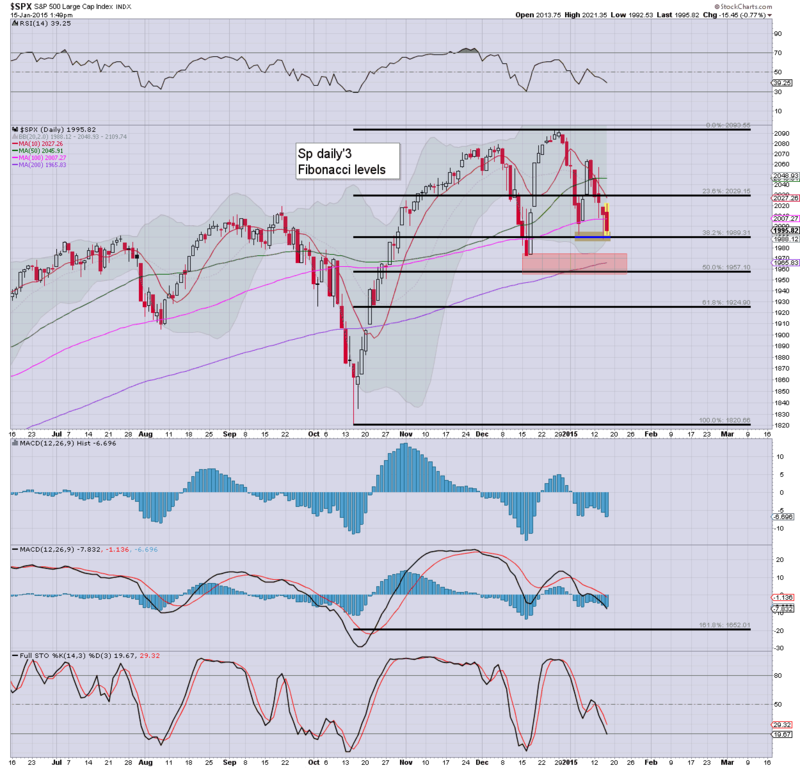 US equities closed lower for the fourth consecutive day, sp -11pts @ 2011 (intra low 1988). The two leaders - Trans/R2K, settled -0.9% and -0.3% respectively. Near term outlook offer a hit of the 200dma of sp'1965, before renewed upside into early February... to be 'inspired' by further QE from the ECB. Another day for the equity bears. However you want to count this nonsense... near term price action remains very weak... and price structure is offering a series of lower highs.. and lower lows. 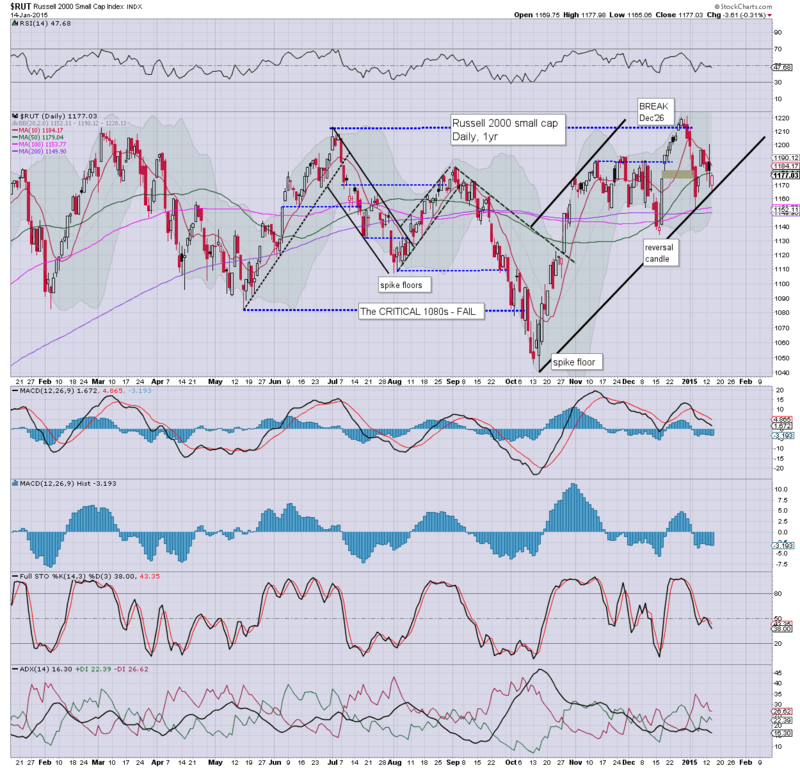 With sp'1992 failing to hold, a further decline into the sp'1960s looks likely. 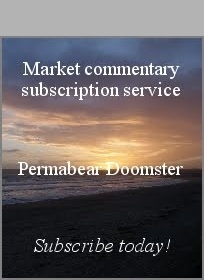 From there though... with the ECB set to spool up the printers... most world markets are set for renewed upside next week.. and probably across much of the spring.